Because the transportation of energy from a solar storm is a large scale problem, in the long term, the Magnetohydrodynamics (MHD) method can better resolve processes related to transportation of the solar wind in the heliosphere. However, evidence from observations made by spacecrafts demonstrates that an acceleration of the energetic particles occurs in instabilities from a solar storm. How can energy from the solar storm evolve from a large scale to a small scale and accelerate the thermal particles into superthermal particles? Up to now, this has been an unsolved problem. Acceleration of the particles happens on a small scale, so in order to resolve this problem, it would be better to apply a simulation method that uses first principles. Based on the above reasons, Dr. WANG Xin from Xinjiang Astronomical Observatory, applied a dynamical Monte Carlo particle simulation to verify that the energy from a solar storm accelerates the thermal particles by the processes involved with a diffusive shock and produced the population of energetic particles. The calculation results showed that the energy spectrum, that followed a power law in the diffusive shock precursor region, was consistent with observed energy spectra from the spacecrafts. This research proposed that the particle injection rate dominates processes involved with dissipation of the diffusive shock energy. The simulation results indicated that there exists an effective small scale mechanism for the shock to transfer energy in accelerating the thermal particles to become superthermal particles. It also provided the reason why the abnormal case of the shock strength is anti-correlated with the shock's speed. This simulation resolved the open problem of how energy from the solar storm dissipates from a large scale into a small scale. This research will play an important role in how space weather forecast models can predict the flux of solar energetic particles produced from a solar storm. The research results have been published in the Astrophysical Journal Supplement Series entitled “The Relationship Between the Particle Injection Rate and the Dispersion of the Scattering Angular Distribution”. Its impact factor is 16.238. 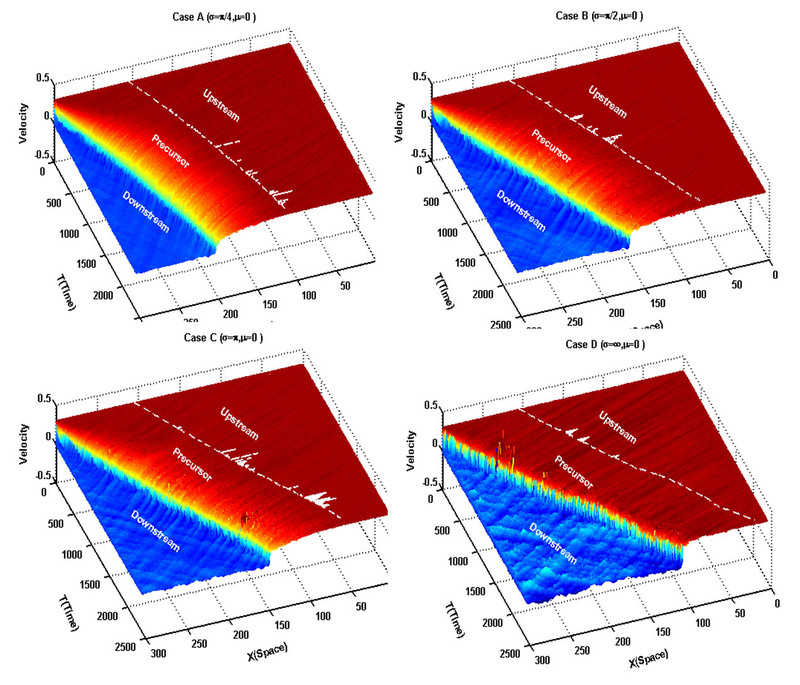 Fig.1 The different velocity profiles of the diffusive shock are evolved with the time from Case A, Case B, and Case C to Case D, with different dispersions of the Gaussianscattering angular distributions. (Images by WANG Xin). Fig.2 The left panel shows that particle injection rate dominates the dissipation processes from thermal particles into superthermal particles. The right panel shows the spectral energy distribution of the energetic particles in the shock's precursor region. (Images by WANG Xin).